By Enhancing interest and assuring teaching quality, we enpower students to open the door to success in learning Chinese as a second language. CSL students are given the most exposure to the language environment and the most flexible curriculum in each class. 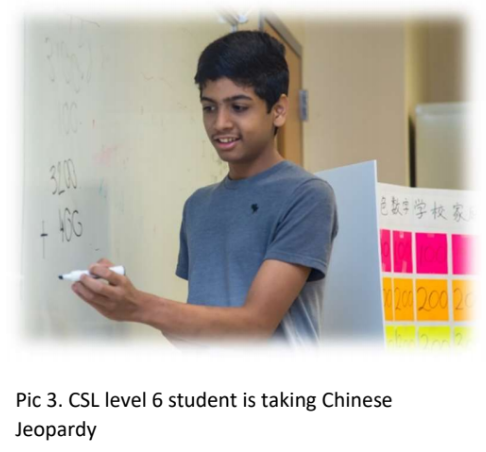 In our view, the CSL program aims not only to teach the students the language, but more importantly is to open the door to understand the mystery of China and the Chinese culture. CSL program has integrated into a large number of "description" element, such as listening to music, watching movies, eating food, listening to historical story or the popular news in order to give each student the opportunity to fully understand the Chinese culture. Multimedia in each classroom greatly increases the amount of information as well to meet the requirements of classroom teaching. CSL teachers try their best to make each child feel the joy of learning Chinese and to enhance students’ interests for learning Chinese. In the Pre-K class for younger children, the teacher combines the cognition and experience into teaching to give students the most intuitive feelings. For example, when talking about fruit, the teacher brings different kinds of fruits on market as visual aids for students to recognize, read and tell; in lesson of colors, the teacher brings colorful play dough for students to play and learn. To deal with the short attention span of younger children, Pre-K and K teachers will intersperse a variety of activities such as singing or dancing or playing games among teaching contents, which makes learning more effective. of professional teachers. 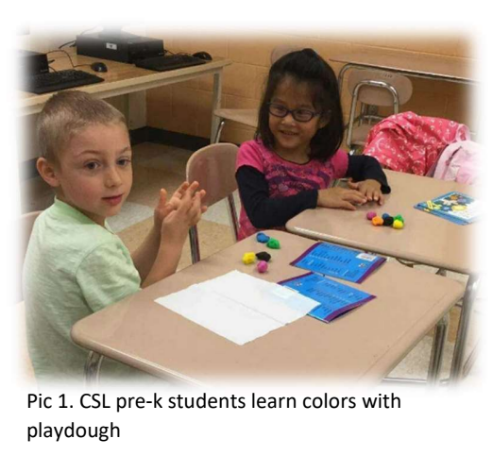 Teaching methods and practical experience are endless, adding bright colors to CSL education. Language experience approach is not only used in younger children classes at CCS. 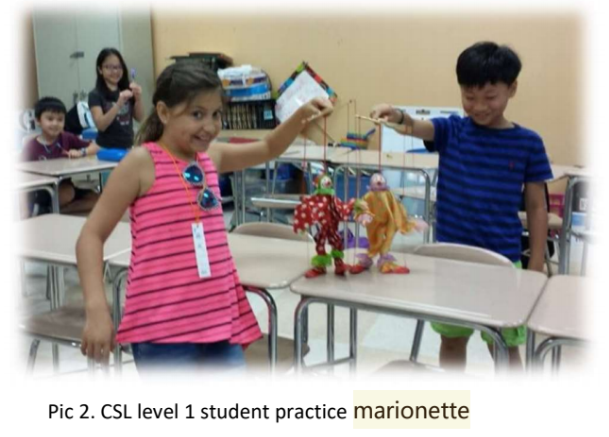 In order to let students to appreciate the art form first invented in China , CSL first grade teacher Mrs. Chen specifically brought the marionette to the classroom for students to play and experience. CSL Sixth grade teacher Ms. Zhao improves the traditional summative assessment, applying formative assessment into teaching so that the classroom is vivid and "acting" up. This evaluation method not only improves students' interest in learning, but also guarantees the quality of teaching, so that non-Chinese speaking students in learning Chinese is constantly on the road ahead with enthusiasm. She also organized a Chinese “Jeopardy” competition at the end of the semester to let the students to apply the knowledge learned in practice by playing the game. To improve the quality of teaching, CSL teachers are constantly enriching their knowledge in teaching. Last year CCS hosted the overseas Chinese teacher training activities. CSL teacher represented overseas Chinese teachers to communicate with other teachers on teaching method evoking warm and positive repercussions. 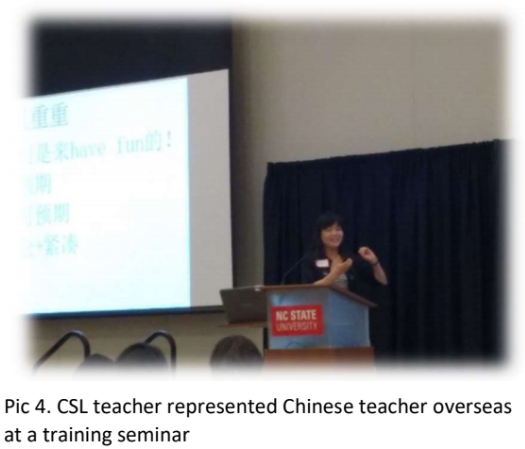 attend training seminar of Confucius Institute at North Carolina State University to enhance their teaching quality and qualification. Enhance students' interest, assure the quality of teaching has been the Cary Chinese School’s goal. And these two aspects are the key to the success of overseas Chinese education. In 2017, Cary Chinese school CSL program will continue its success and spread its wings to fly forward as a pioneer in promoting and developing Chinese culture.